The original trail trusts had a collective vision of what these trails could offer: quality products and unique stories set in diverse and stunning landscapes. The Roxburgh Gorge Trail connects Alexandra to the Roxburgh Hydro Dam and Lake Roxburgh Village, via 21km of cycle tracks and a 13km jet boat experience. The Clutha Gold Trail continues the journey, following the Clutha River for another 74km downstream to Lawrence. Chair of Central Otago Clutha Trail company (the maintenance arm of the Clutha Gold and Roxburgh Gorge trail trusts), Stephen is driven by community spirit and a desire to see his local townships grow and thrive. Most of the trusts I have worked on have involved very special people. Their different skills and values bring great dynamics to the table. I find most people in Central enjoy working together on a project—there is a real sense of community spirit. Despite our small population base we seem to have a high number of community-minded people and to be honest, without them, initiatives like the trails simply would not happen. Many of us in the trusts and the company are out there riding the trail each week. Rod Peirce is a bit of a legend, easily spending 20 to 30 hours a week on maintenance, and the others report any issues they might come across. Protecting Central Otago’s rich heritage is important—but so too is celebrating that heritage. The trail company understands this need for balance. There are more heritage sites per kilometre in the Roxburgh Gorge than almost anywhere else in New Zealand. Before the trails opened in 2013, there was virtually no public access. Now, within 15 minutes of leaving Alexandra, you can enter a different world—the sheer scale of the river and gorge is spectacular. There was some initial concern that opening up the trails might result in damage to the heritage sites but that has not happened. In fact, some sites are so disguised by the passage of time that people cycle straight past without noticing them. Taking note of the past can save many a mishap from being repeated; it can equally provide insights to success. 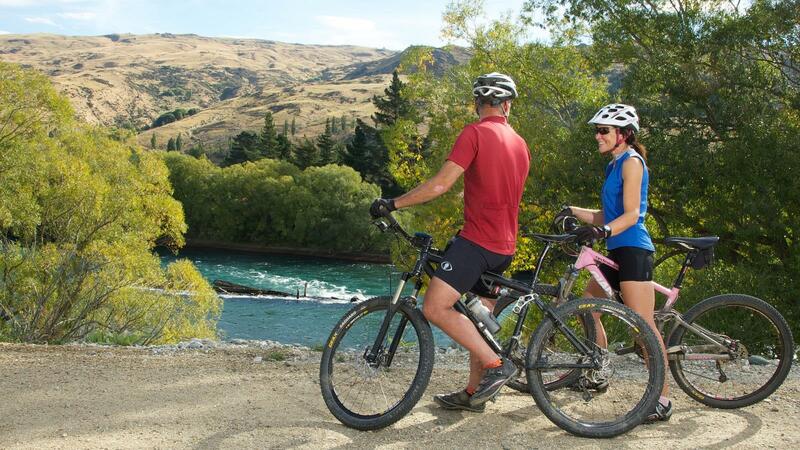 The Roxburgh Gorge and Clutha Gold trails offer a rare opportunity for those who walk or cycle the trails to experience Central Otago’s past, up close and personal. Many people never get to see the detail of New Zealand’s heritage but the trails offer a great insight into our history. The Clutha Gold’s Lonely Graves and Teviot Woolshed are great examples, and old mining sites and schist huts virtually line the Roxburgh Gorge trail. And we are not finished yet—we are looking at creating offshoots to the trails and directing people to even more sites of interest. A group of passionate individuals with a deep commitment to their community had a vision to create a premier cycling and walking trail suitable for all ages. Their energy, skills and dogged-determination inspired others to join the campaign. Now, they are looking forward. I want to live in a vibrant community, one that is functional and full of diversity. My drive has always been to bring people back to the valley and see our businesses grow. The trails are helping make that happen. People riding their bikes through the community not only have minimal environmental impact but can also have a significant economic impact. They certainly add to the vibrancy. With the prospect of future trail networks linking up across the region, I am looking forward to seeing our communities continue to go from strength to strength.